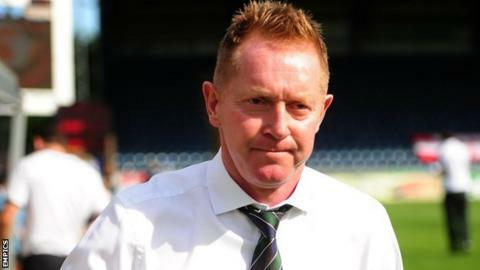 Oxford United boss Gary Waddock has warned his squad they are playing for their futures in the final two League Two games of the season. The U's now only have an outside chance of reaching the play-offs - trailing seventh-placed York by five points. Several players are out of contract in the summer and Waddock says they must prove to him they are worth a new deal. "They are playing for their careers," Waddock told BBC Oxford. "Once they get on that pitch they are judged." Oxford are on a dismal run of two wins in 13 games, including one win and five losses from the six matches since Waddock took over. And the former Aldershot and Wycombe manager said that record is not good enough. "Over the last 15 or so games we have lost far too many matches and I don't want that here at this football club," he said. "This is a very, very good football club. It is fantastically supported and it needs to be addressed, simple as that. "Players are now playing for their careers and futures and whether they are under contract now or not, they are playing for their futures. We've got two games left and they have to show me they want be part of this football club." Captain Jake Wright is among those not yet to have had their deal extended and he has warned the entire squad need to prove they are good enough to be retained, adding any player who thinks they can leave the Kassam Stadium and walk into another club is seriously mistaken. "Same as all the other out of contract players, we have two games left to prove we want to be here and earn a contract and not just here but anywhere," Wright said. "If this club doesn't want you then other clubs are going to look at our record and see that in the last 15 games we haven't been good enough. Managers from other clubs are not going to want losing footballers and that is what we are. "If you have a contract the gaffer is starting to line up for next year and he has been honest with us and will not want us here. We are playing for out careers and our livelihood." Meanwhile, academy duo striker James Roberts and winger Sam Humphreys have been offered professional deals following their two-year scholarships.